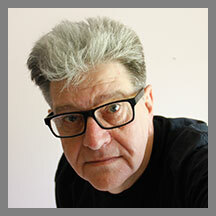 Ed Lawrence has explored many visual art media and always returned to photography for artistic expression. He received his first camera for his ninth birthday. It was a Kodak Brownie with a flash attachment. His parents never really understood at that time why he took pictures of everything except people. He wanted to photograph shapes and patterns that interested him. His best friend's house had a darkroom, and as a boy, Ed spent many hours in that red-lit room exploring the magic of developing film and making prints. While studying fine art in college, it was the photography projects that helped Ed understand abstraction. As a young graphic designer, he maintained his interest in photography but put his Nikon 35 mm camera aside and started using a Kodak Instamatic. It was inexpensive, pocket-sized, easy-to-use and perfect for capturing the unique architectural patterns and design details in his city environment. When the Polaroid Land Camera SX70 became popular, Ed fell in love with the instant gratification, harking back to the darkroom days of watching a print magically develop. Mistakes could be made and corrected in the next shot with the Polaroid. It was an experimental format with less emphasis on detail but more focus on color, texture and form in his compositions. Photography fell to the wayside as Ed Lawrence advanced his professional career and became very busy as the father of two boys. His oldest son, when in high school, found the old Nikon camera tucked away in a closet and took an interest in photography. It became a father-and-son activity for the pair to ride around country roads chasing sunsets — the son with the film camera and the father with a digital camera. Ed became hooked on photography once again. Digital photography provides all the elements that have drawn Ed Lawrence to the medium throughout his life. Not a photographer's photographer, he could care less about the world of apertures, f-stops, ISOs and metering. Ed Lawrence just uses a camera to paint what he sees.